Of course my June self-portrait pays homage to our trip to Europe: it was the main event of the month! I selected this shot because of the memory it evokes; a coffee & dessert date at Ladurée followed by a stroll in the Jardin du Luxembourg. We polished off the box later that evening while perched along the Seine watching the sunset, happily buzzed from a bottle of rosé. If this all sounds too cliché, that's because it is, although with Paris, everything feels cliché in the best possible way. Our hotel was nestled in my favorite neighborhood in Paris--Le Marais. We were a stone's throw from Place des Vosges, argued by many to be the most beautiful square in the city, a fact I cannot dispute (here's a shot on instagram). If I'm remembering correctly, I think we stopped briefly to eat one or two of the macarons there before wandering off to finish the rest by the river. In my opinion, the best way to enjoy Paris to keep it simple. Splurge on good food, wander everywhere and pause often to slow down, sit back and take it all in. Aren't most things that are pleasurable at least a bit clichéd? 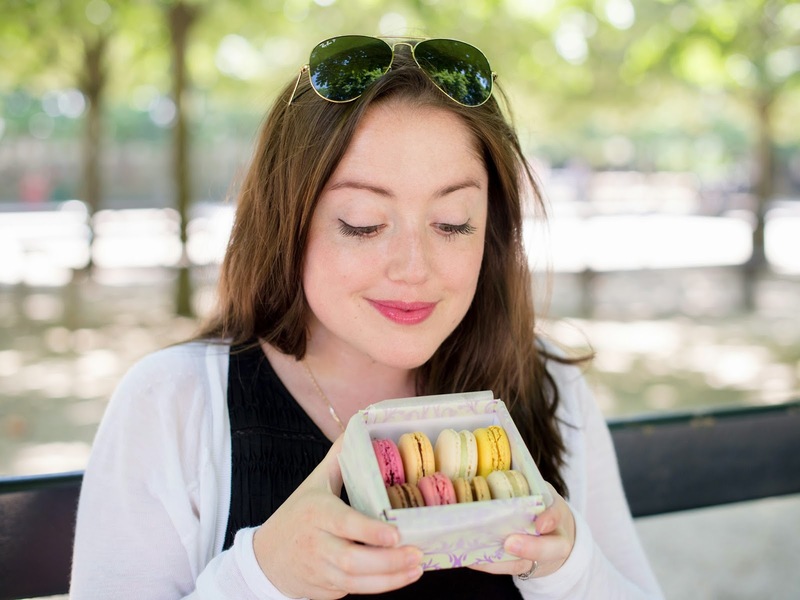 Enjoying them is what brings us all together in one macaron-loving coffee-sipping gaggle! I figure that as long as you enjoy yourself, cliché matters not. Absolutely the best way to enjoy Paris!